Vice President Yemi Osinbajo said Monday that the Federal Government was committed to ending the incessant clashes between herdsmen and farmers in the country, which have left thousand dead and many injured. 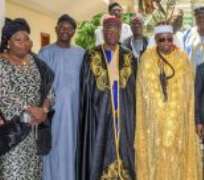 “President Muhammadu Buhari is determined to resolve the herdsmen-farmers clashes in Adamawa State and return peace and order to the affected communities,” the vice President told a delegation led by the traditional rulers of Batta and Bachamma communities, in Adamawa State. He spoke at the Presidential Villa, Abuja, while receiving the delegation. Since visiting the affected communities, in Adamawa on December 5, 2017, the vice president had commenced a series of national consultations with all relevant groups to find a lasting solution to the conflict in parts of the country. On the issue of proffering permanent solution to the crisis, Osinbajo further said the report provided by the National Animal Production Research Institute (NAPRI), Zaria, would be considered admonishing the people of the affected communities to embrace peace and not to seek revenge. Also speaking, the Hama Bachamma echoed the words of the Hama Batta, and thanked the Presidency for its efforts so far in tackling the issue.